Glamour for cold feet at kindergarten | Hello Craft Lovers! The autumn is slowly getting colder here. Kindergarten is located in an old beautiful building. 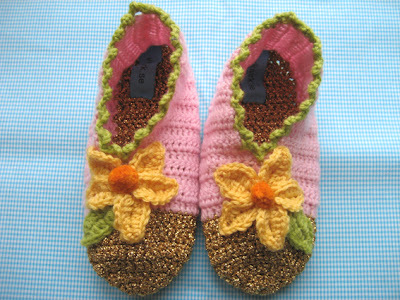 Only one flaw… draught… Crocheted these slippers for tomorrows games. 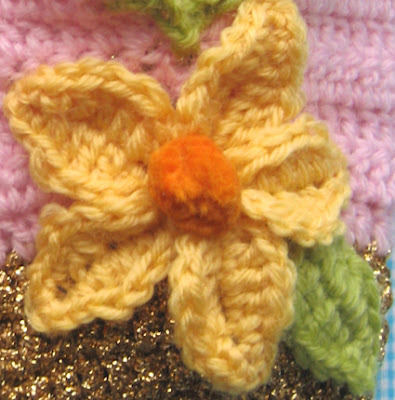 The flower is built up of standard leafs sewed on one-by-one (point out) and a ball, cut from a ball-ribbon, in the middle. Anti slip á la glamour with soles of metallic gold yarn. Flower petal: chain of 7 turn, 2ch, 3dc, 2sc, 1sl st, 1ch, turn and crochet back on the ”underside” of the chain; 1sl st, 2sc, 4dc, last 1 sl st in the first ch. Leaf: same but with chain of 10. (=7dc).